This 1955 Ford Crown Victoria in Torch Red and Snowshoe White captures that fifties look perfectly. Ford totally redesigned their cars for '55 and they were really starting to show the glamorous style that the late fifties was famous for. 1955 Ford styling was completely new. There were much sharper lines and sharper angles producing a fresh look from their previous cars. New two-tone color schemes had now been introduced using the new side trim lines to split the colors rather than just at the base of the roof line. This particular Crown Victoria spent much of its life in Texas before undergoing a full rotisserie restoration recently. 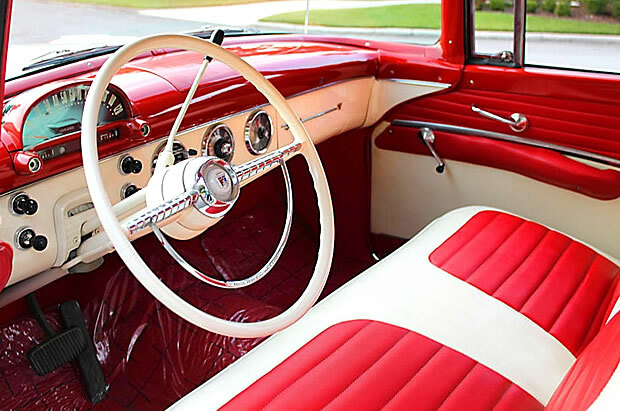 The speedometer with transparent hood for daylight illumination was a carry over from 1954 but the rest of the dash was new. Ford described it as the New Astra-Dial Control Panel and boasted the speedometer was high up on the control panel in the drivers line of sight. The new full-circle radio dial matched perfectly with the circular heater control and clock. The Crown Victoria was part of the top-of-the-line Fairlane lineup. The Fairlane has a distinctive V-shaped side trim that ran the length of the car and is used to divide the two-tone color schemes. Wraparound windshields were new for '55 too. 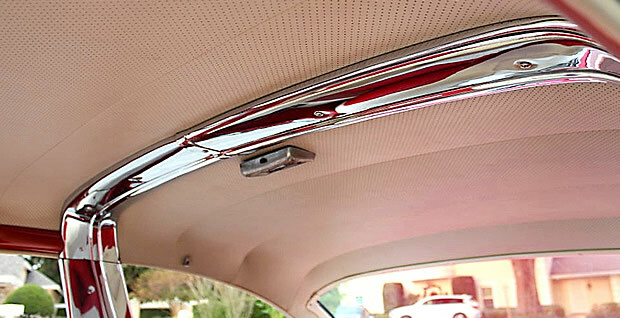 Unique to the Crown Victoria is the non-structural chrome band (tiara) that runs from the B-pillars and across the roof. This chrome band was also repeated inside the car, sweeping down the pillars, across the side panels and right across the top of the back seat. 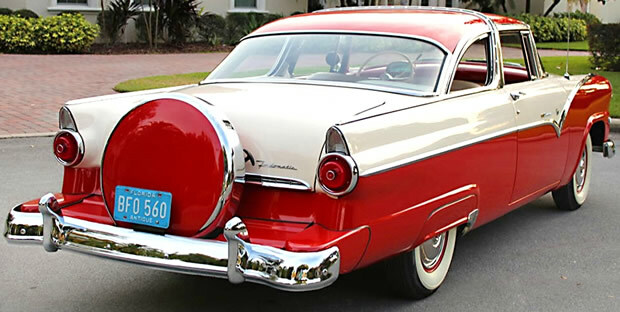 Fairlanes also came equipped with two sun visors, half-circle horn ring, twin horns, arm rests, cigarette lighter, stem-wind clock, bright moldings around the windshield and back window, chrome eyebrows above the headlights and Fairlane nameplate and crest on the hood and desk lid. The side of the car also featured a crest and a body style nameplate. 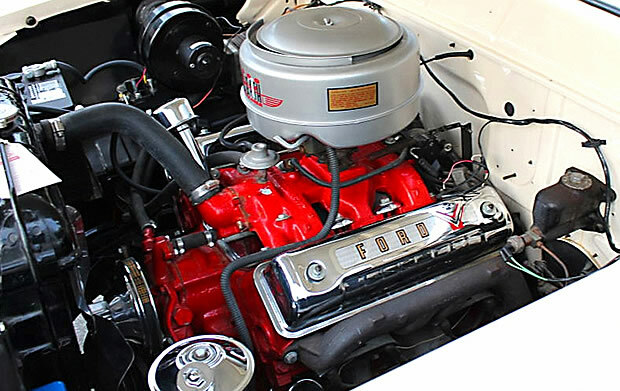 Also new for 1955 was the Y-block 272 cubic inch (4.5 liter) V8. It was based on the previous design but another 33 cubic inches was added and produced 162 horsepower. It has a 115.5" wheelbase and the overall length is 198.5" excluding the continental kit which is an aftermarket item. 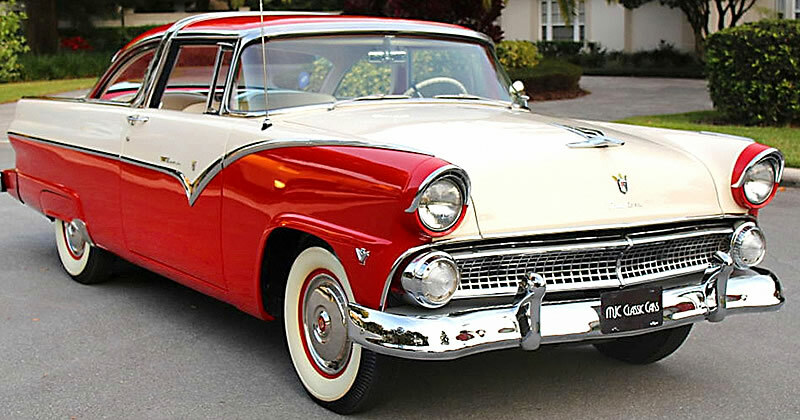 There were 33,165 Crown Victoria cars produced by Ford for 1955, with a base price of $2,302. This car was originally assembled in the Dallas, Texas assembly plant. Extras installed with the car included the 272 V8 engine, Ford-O-Matic Drive automatic transmission, power steering and a continental kit.